Last weekend, we went to Newport Sands for a picnic and a play. 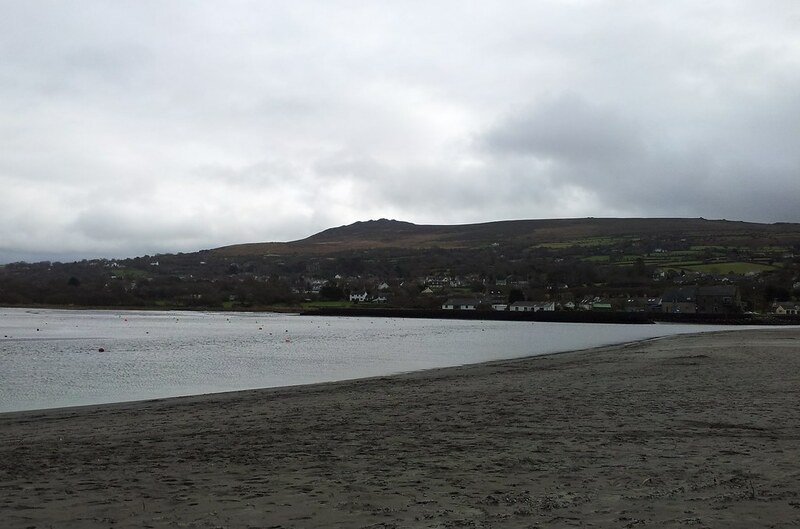 From the beach and car park, you can see “The Sleeping Giant” on Carningli Mountain. He is said to guard the folk of Newport, Pembrokeshire. Personally, I find him a useful tool to quieten down over excited, noisy children. I had planned to eat our picnic on the beach. However, it was very cold and windy, so Dave suggested we eat in the car, that way we would only have to brave the cold once we were active and able to keep warm. This was very practical, however once I get somewhere, I can’t wait to get out of the car, stretch my legs and explore, so I had a little sulk until I started to enjoy “People Watching” all the activity that was going on down the beach below us. We saw a lovely young couple with a toddler and two dogs. 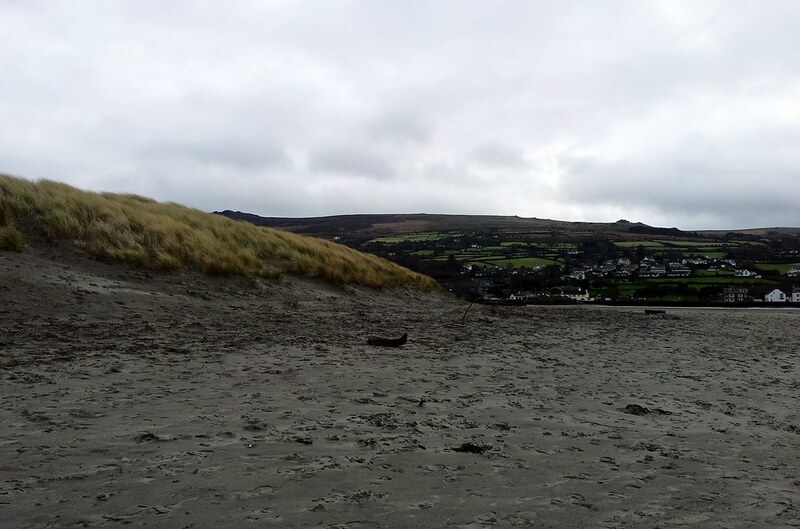 The Dad was full of fun and kept running into the freezing sea to encourage his dogs to have a swim. He also did funny dances to make his daughter laugh. Then he started pushing the buggy into the water, just far enough so she could see the water, but not too far such as she would get wet or to put her in danger. Then two other couples with dogs emerged on the beach, the three couples were all quite far away from each other, but at one point all the dogs ran to each other at a central point on the beach, had a sniff, made friends and played until each pair of owners, or Pack Leaders, were once again in sight and they dutifully returned. Once we’d finished eating and Dave started preparing to go down to the beach, I did joke that he could take the kids on his own, as I was now having a grand time being nosey in the car! The kids and Dave twisted my arm though and I agreed to come with them. 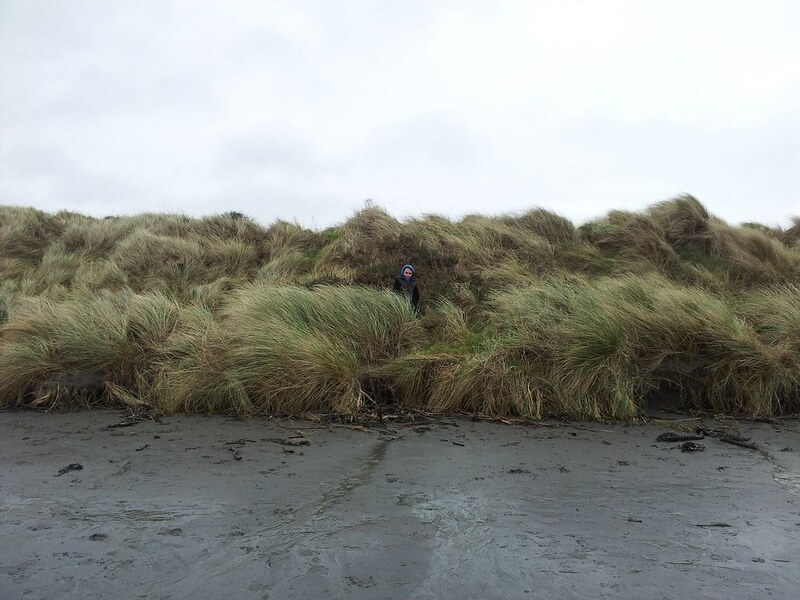 Danny explored the sand dunes. 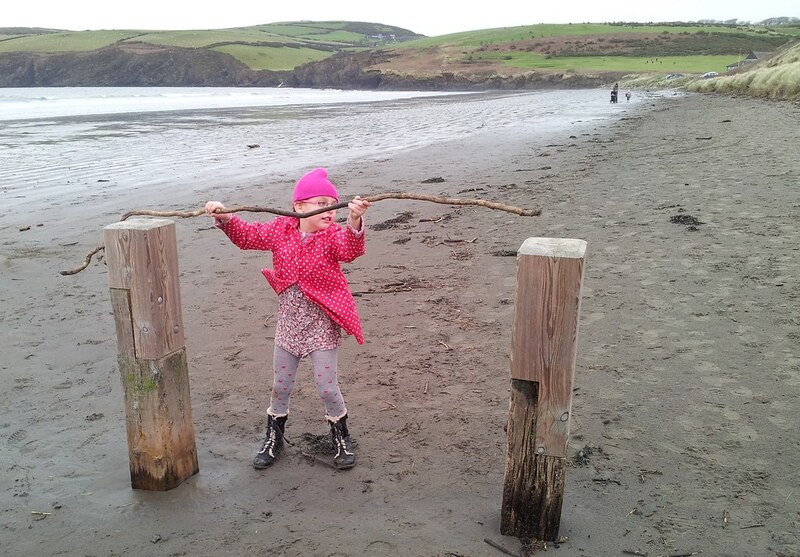 As you will have seen from my Silent Sunday post, Rebecca found a large stick, placed it on two posts and set up a game of limbo. Danny and Rebecca effortlessly limboed under the stick. I very clumsily laughed my way under it somehow managing to not break my back. Dave is very fit and agile and could have quite easily limboed under it, but first he limboed Isabelle under in the buggy, as we all sang, “Limbo, limbo, limbo!” and “How low can you go?” then went to Limbo himself, but at the last minute changed his leg first stance into the easier, cheating, head first one and easily ducked the limbo. The kids sighed at him then went on exploring. 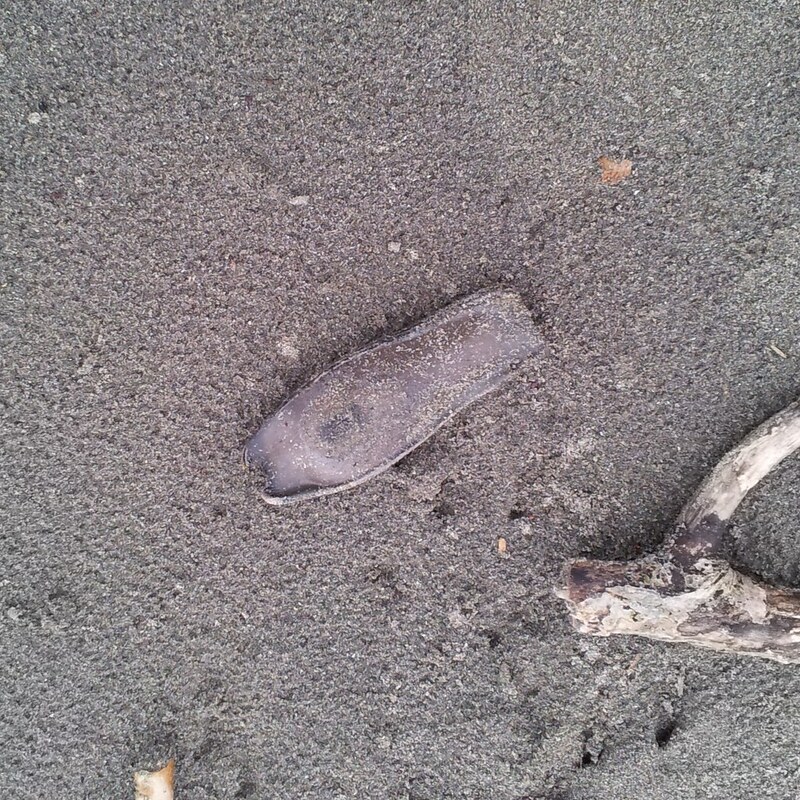 They found a Mermaid’s Purse egg case. They used sticks to write in the sand. 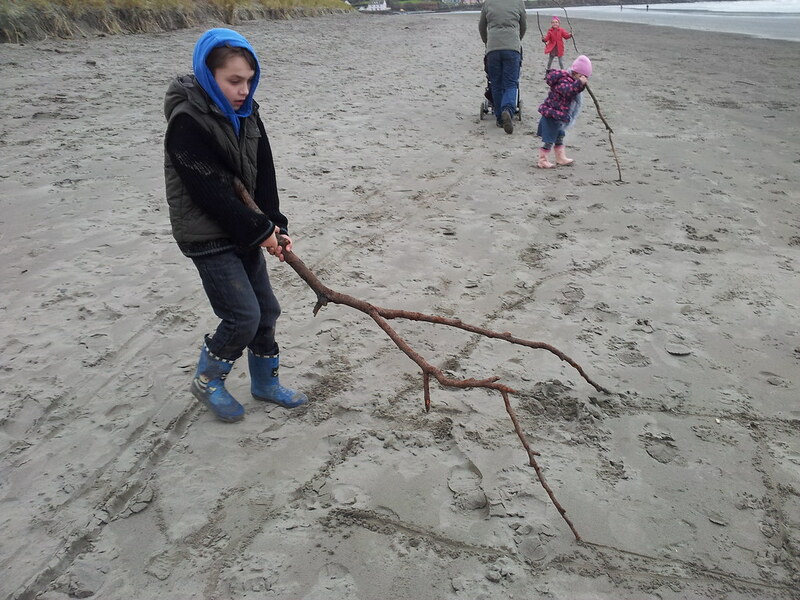 Once Danny began making parallel tracks with a two pronged stick, the girls were on a mission to find one for themselves. Danny teased me that Dave had wrote “Dave *hearts* Claire” in the sand. Hmm, I wonder who really wrote it? 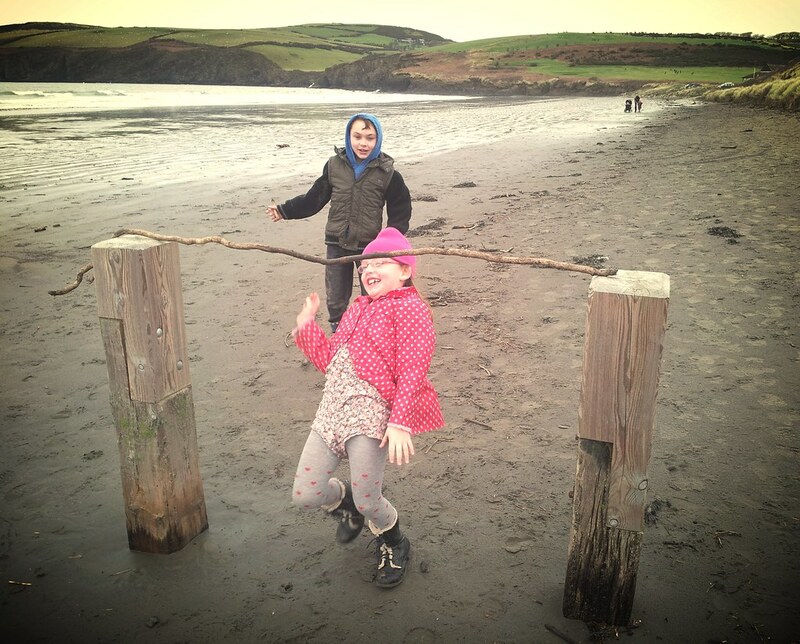 They pretended to fish in the Nevern Estuary. 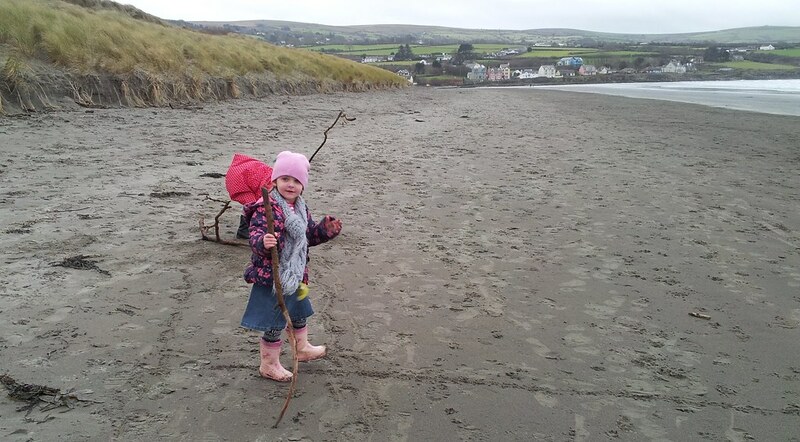 Isabelle enjoyed her stroll along the beach. Rebecca, behind Dave and Izzy, was burying treasure (pretty pebbles and shells) and marking an “X” where the treasure lay. My job was to find the treasure. 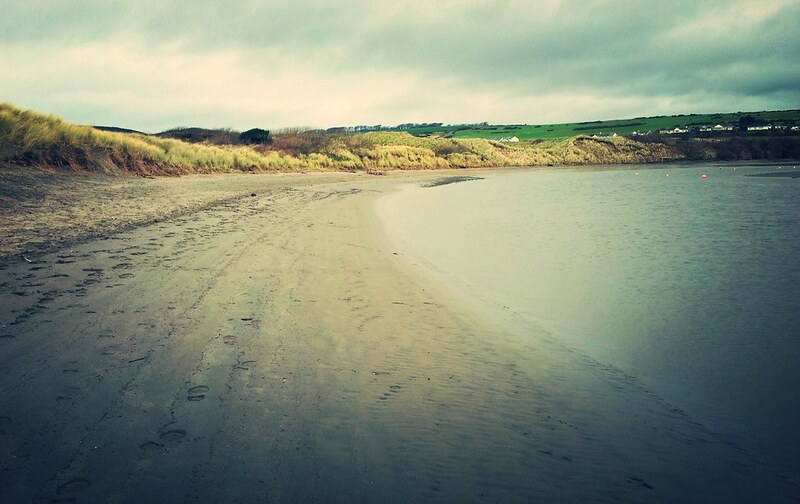 A beach in Winter is a beautiful sight. Once again, reflections in the watery sand. Dave and I have lived by the beach our whole lives, we obviously know how the beach works- the waves going in and out and the tide coming in. However even we can sometimes be caught unawares by how rapidly the waves can come in closer and closer to the shore. 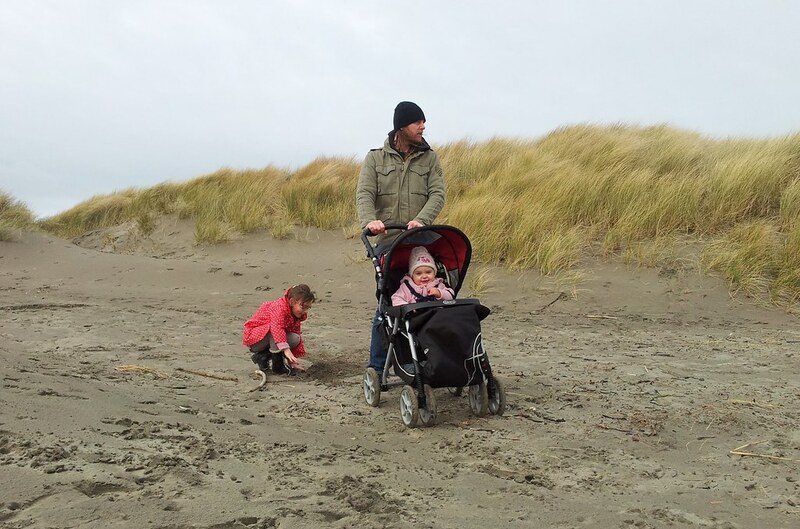 We had walked Isabelle down to the water’s edge, she was happy and excited, so we only had eyes for her when suddenly a rapid wave broke on the shore soaking both ourselves and Isabelle and the bottom of the buggy. Thankfully, we all saw the funny side and laughed about it. 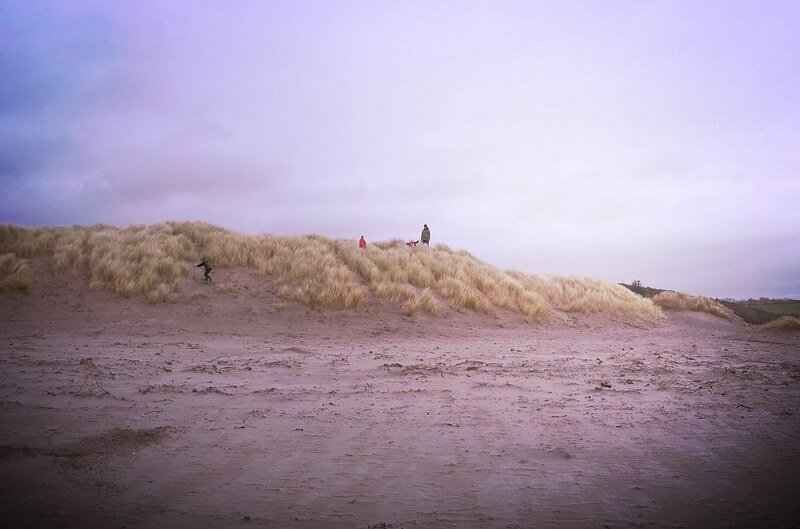 Dave, Danny and Rebecca walked along the sand dunes back to the car, whilst Izzy and I enjoyed walking by the water’s edge once more. 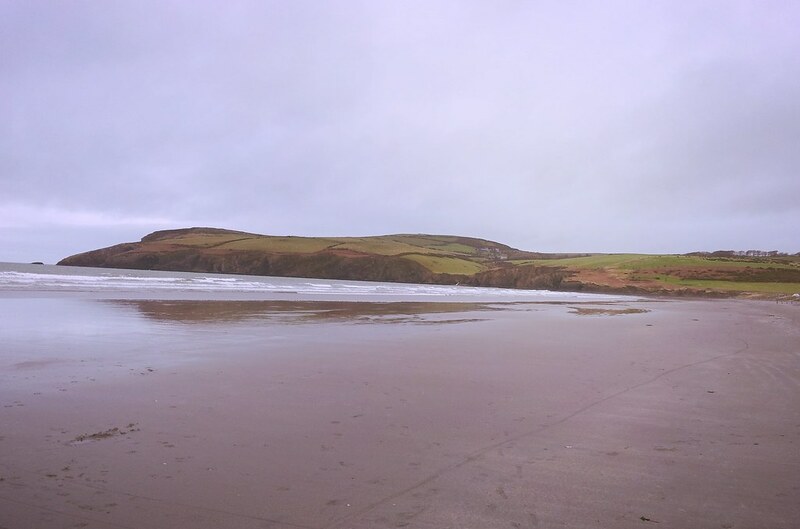 As we were leaving, camper vans pulled up on the beach, the salty sea scent became replaced with petrol fumes, the sound of the waves crashing was drowned out by mechanical “buzzing”. The Jet Ski engines were fired up, and as fun as it looks, I think we chose the right time to leave. 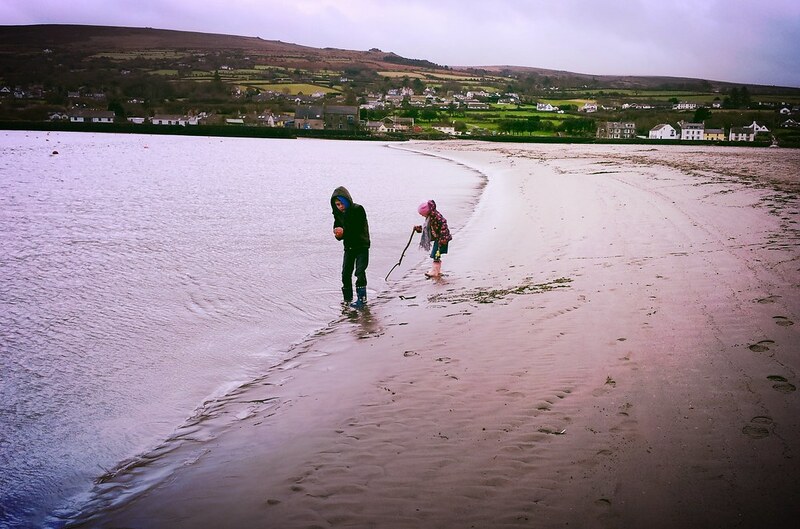 Looks like you had a lot of fun.We always write in the sand – I tend to the heart thing :O)Am glad you saw positives when people watching because I all too often see people with no patience with their children. 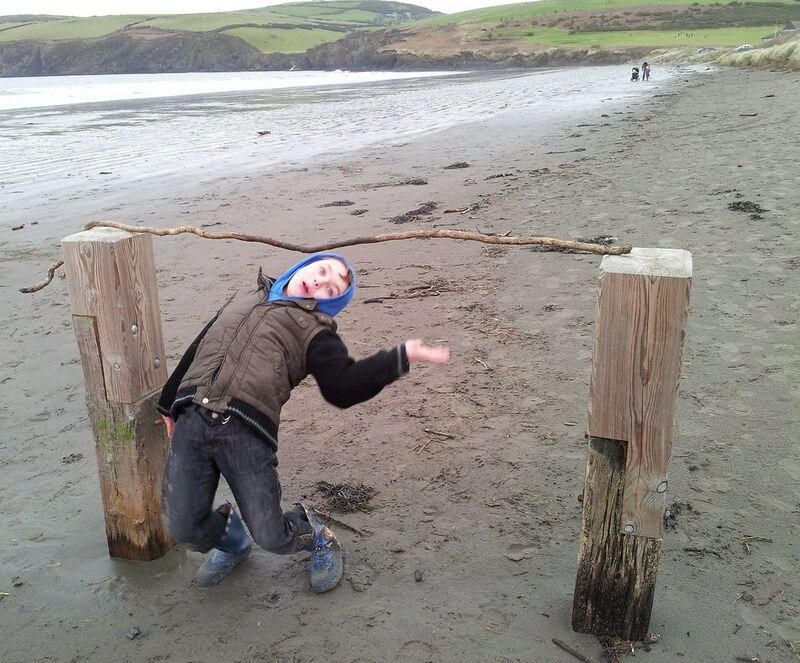 I love the limbo dancing, that's a great idea for the beach! I don't think ours have ever been to the beach and not come home wet, they always stand just a little too close and get caught by a wave! 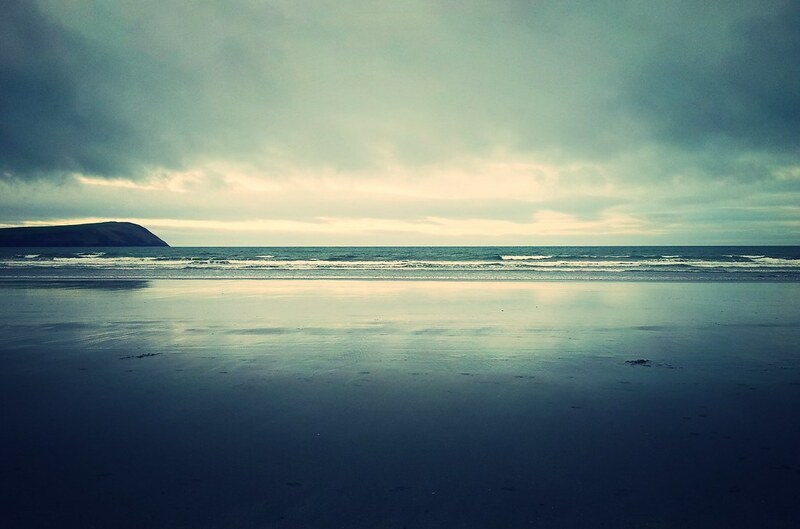 Lovely beach photography. Thanks for linking up. Some lovely pics. 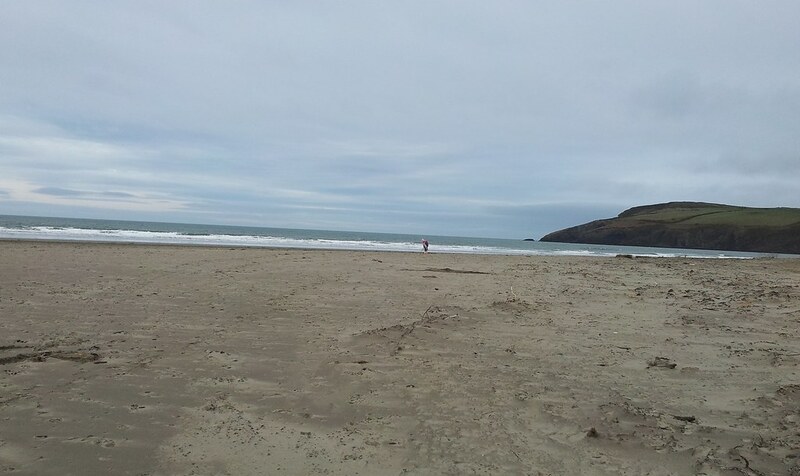 I love going to the beach when it's empty. Just a shame we live pretty much as far as possible from one!